The next step in Bose noise reduction headphones. A smaller, lighter on-ear design--delivering the same levels of acclaimed performance as our around-ear QuietComfort 2 Acoustic Noise Cancelling headphones. You enjoy the same total noise reduction and audio quality, with an equally comfortable fit. No headphones will eliminate all noise. But the Bose technologies in QuietComfort headphones work together to make almost any listening experience more rewarding. Wear QC?3 headphones when you fly, and you'll notice a dramatic reduction in engine noise the moment you turn them on. For quality audio, simply plug them into your portable player or the inflight entertainment system. Use them at home or at work and you should find distractions fading softly into the background. You can pair QC3 headphones with most music-enabled mobile phones too, using our optional mobile communications kit. Our full-spectrum noise reduction fades background distractions and dramatically decreases engine roar on planes. Quality Bose sound reveals audio nuances you might have missed. And a lightweight, on-ear fit provides hours of comfortable listening. Bose Acoustic Noise Cancelling headphone technology in QC3 headphones electronically identifies, then dramatically reduces noise, while preserving the audio or tranquility you desire. Proprietary signal processing and TriPort? acoustic headphone structure also assure quality audio performance--and deep low tones--from these small, lightweight headphones. It's a unique combination of benefits and technologies available only from Bose. 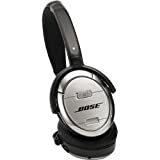 I have read many of the other Amazon reviews for Bose Quiet Comfort 3 headphones, and I recall reading about "ear pain" and "humming noises" "muddy sound" and other anamolies & problems regarding the noise cancellation feature. Of course I rather not to read others' criticisms until I actually get the product and try them myself. So after receiving my pair of headphones I can loudly say that I do NOT agree with many of the criticisms of other reviewers. Most importantly, Bose Quiet Comfort 3 provides the best sound I've ever heard. The stereo sound is breathtaking. Never in my life have I heard so many sounds and instruments, many of which were usually tucked away in other sound systems. Bose does a great job of revealing all the instrument parts. Because of its high resolution, however, the headphones can reveal the limitations of the original source recording. Therefore, many monaural (non stereo) and poorly recorded recordings might not sound too good in headphones. Bose is for stereo sound, professionally recorded in the studio. Any well-recorded piece of music will be enhanced in ways you might have not concieved with another kind of headphone. I feel that the noise cancellation feature is more than adequate. Yes it doesn't completely block out extraneous sound, but I don't think it needs to do so. When I'm wearing the headphones, I'd rather know what's going on in my surroundings. I don't want to be totally unaware thru complete sound reduction. Nevertheless, there is enough noise cancellation so you can hear the music from the headphones withoug too much distraction. I have yet to bring the headphones on an airplane, but I am sure they will be serviceable when the time comes. By the way, I don't recall the sounds of the airplane being too oppressive!! (are they??!!??) I know that these headphones were designed for the air traveler in mind. But I still feel that the biggest noise problem on board are crying children, obnoxious tourists!!! Therefore the noise cancellation feature works best to cancel out the obnoxious person sitting next to you. After about an hour of headphone time, I can say that they are comfortable. NO EAR PAIN!! Some people just might have sensitive ears. But mine were fine. It's a comfortable headphone. Very nice set of headphones. Many of you out there who are reading this review, are considering to buy a noise canceling headset. There are many to choose from with brands starting from audio technica to sony. But the one brand that I have always been particularly fond of are the ones from Bose. Offering quick and nice build quality, the bose quietcomfort 3 is one of the best headphones I've owned so far. I've had other noise canceling headsets, from the sony mdx series to the in-ear shures e5c. None of them how ever, could match to the sound quality/weight/build quality of the quietcomfort 3. Now remember, the quietcomfort 3 is a set of headphones that are put-on-ear headphones. It is built for people who do not enjoy the idea of over the ear headphones with added sound white noise "pressure". Simply because it uncomfortable for some (including myself and my girlfriend). Also the weight of these headphone are supremely light, in comparison to the sony mdx headphone series. And the headphones do offer monitor support, as there are two out monitors of the headphone that constantly seeks outside noise, while maintaining a noise canceling environment. It is a hard concept to adapt, as I didn't understand it at first either. I bought the Bose QuietComfort 3 Acoustic Noise Cancelling Headphones right before I went on a cross-country flight to the west coast. I was tired of barely hearing my earbuds while on planes, so I decided to finally make the purchase which I had been contemplating for months. When my QC3s arrived from Bose, I was anxious to try them out. I had used them previously a few times (albeit briefly) at my local Apple store, so I already knew they sounded great, but when I popped the battery in, flicked the switch, and selected a song on my iPhone, I was amazed at the sound these things could produce. The QC3s deliver AWESOME bass and everything is crystal clear. As for noise cancellation, I did not get to experience its true greatness until I left on my flight. I was shocked at how much of the engine noise was eliminated; at the flick of a switch, 90% of it was gone. I was finally able to listen to my music in its full glory for the first time in the sky. I will never fly without these headphones again. The difference is like night and day, they're worth every penny. Just a note, if you plan on using these with Apple's iPhone, you'll need to buy Bose's "mobile communications kit" in order to get a cord that has a headphone connector of the right size. It's $39, but it also comes with adapters for Blackberries and other phones, and lets you talk through the microphone integrated into the cord (at least on the iPhone, not sure about other phones). Well, the first set of headset I received from Bose worked fine for about four months. Then all of the sudden they stopped working. I contacted Bose and they gave me a return code. Sent the product back, and received a new pair. Something I really did not like about this is that I had to pay the S&H cost ~$7, I mean is not like I broke them. So I received my new set and works fine, no problems until lately when I noticed the cable started to wear out from the headset end. I tried getting a cable in RadioShack but Bose created its own Stereo connector(three strips), so the Radio Shack 2.5mm stereo (two strips) adapter did not work, lots of noise. Thank God I contacted Bose (even though my warranty had expired) they sent a new cable with no cost for me. They have excellent sound, good response, bass, and is a clear sound. I'm not an expert or anything but from what I like these are perfect. Not good, it looks Bose can improve on this field. You need to really take good care of these in order to get a long life out of them. I've flown with these and been in noisy environments, they are good noise-cancelling headsets, though there can be better at a better price noise-cancellation is your need. So far I've not had problems with the battery, but i've seen the battery and it's costly: $50 for a new one. Though, I haven't done the math on how much would I have spent on disposable batteries. These are perfect for me; I've had no issues at all with the fit or comfort, though I noticed the left pad has started to wear out. But that falls on the durability section. I would say if you have the money go ahead and buy them, besides Bose has an excellent plan to pay over a year, so that's good. On the other hand, you can probably try the Shure E5 or Sony NC50, also the Audio-Technica ATH-ANC7 are a good option at a way less price. Personal experience has been bumpy but Bose's customer service lived up to my expectations. Bought my QC3 headphones after comparing the QC2 and QC3 at a Bose store with the in-store airline noise simulation. I immediately noticed that the QC3 provided more noise cancellation than the QC2. I purchased the QC3 based on this functional aspect. Music reproduction and comfort were secondary considerations, but at the time both seems very satisfactory. After using the QC3 on a recent 5 hour flight to the West Coast, I am still satisfied with the comfort and music reproduction aspects of the headphones. Although I am not a audiophile, I would agree that the comments others have made about the QC3 musical reproduction qualities seem to be true. I think there were probably design trade-offs that the Bose engineers made in order to achieve the excellent over-the-ear noise cancellation levels in the QC3. For me, the on-ear headphone comfort seemed to have a limit of about 6 to 7 hours (I had a two segment return flight of about 8 hours). However, the QC3 is a very comfortable headphone; they sit rather loosely and exert very light pressure on the ears. In certain situations, care should be taken to prevent them from falling off; bending over quickly to pick something up may cause them to slide off the ears slightly. What I think is the ultimate value of this product is how relaxed and rested I felt after the 5 hour flight between Hawaii and Los Angeles. These headphones are simply amazing and an indispensible accessory for the business traveler. The 'noise cancellation' seems to be selective; although all environmental noise is muted, background 'industrial' noise seems to be the primary target of the noise cancellation electronics. I am very happy with my purchase and thank my co-worker for the information he provided about his three noise cancellation headphone purchases before getting his Bose QC2 headphones. I went directly to the Bose store and decided on the QC3 model. I am an experienced frequent air traveler (in average I do a bit more than 100K miles per year), including frequent 8 to 10 hours overnight international flights, and also 2 to 3 hours hops. So, I do lot of reading and really couldn't take that much travel without my Bose? QuietComfort? 2 Acoustic Noise Cancelling? Headphones to listen to my iPod, including sleeping with the headphones. My first QC-2 broke at the left stem a bit less than a year, but Bose replaced them with no questions asked. The second QC-2 lasted for a bit more of two years, completely worn out, and officially pronounced death when the left stem broke again. So I was facing the decision to go again for the QC-2 or switch for the QC-3. The smaller size of the new model was key for going for the QC-3, but I was very concerned about the recurring breaking of the left stem in any of the two models. I am no sound expert, so I left that to any of the good reviews below. When listening music from my iPod at a decent volume level, the QC-3 allows you to enjoy the same virtual sanctuary as the QC-2, not only from the jet engines, but from cabin noise, and even your neighbors' chit chat. With my new QC-3 I realized how much I was missing this level of tranquility. Besides, the smaller ear cups are much more comfortable, particularly to sleep, with the same sound quality and noise cancelling. As reported by some fellow Amazon reviewers, ear pressure from the more pro-active noise cancelling of the QC-3 was a key concern. The signal to cancel out the noise is stronger on the QC-3 to compensate for the smaller ear cups. The salesman confirmed this. So far, I have not had this problem at cruising altitude, which often is 6 to 7 hours long. However, my ears have always been very sensible to changes in air pressure during a flight, particularly at the beginning and during the descending phase, so I do get a minor ear pain, but the pain did worsen very often with the QC3. Sometimes the pain has also happened when climbing to cruising altitude. Fortunately, descend almost coincides with the time to turn off all electronic devices, so it became more of a wake up call for me. Anyway, the sales guy said they were not aware of this problem, but I had the 30-day trial to exchange them for the QC2 if the problem arises. I rather enjoy the comfortable smaller size, so I decided to live with this small inconvenience and kept the QC-3. I strongly recommend you do ask for the trial period, clearly this issue depends on how sensible your ears are to air pressure. I rather prefer to have a spare battery just in case I do run out of juice in the middle of a long-distance flight, as you do with the QC-2. And a spare for the QC-3 will cost you an extra 50 bucks. Since I went for the QC-3 without the spare, so far I have been getting at least between 16 to 18 hours. So, now I am not so concerned about the rechargeable QC-3 batteries, and you can charge it on any regular plug. Furthermore, even for a frequent air traveler like me, the promised 500 charges should be enough for several years. Have owned 3 Nose Noise Cancellers - thus that should prove that the technology was convincing for me as a frequent traveler ! The noise cancellation feature hurts your ears. Otherwise very good. If you have sensitive ears, you may feel dizzy after extended use. The noise cancellation feature seems to be the cause. But some other people do not seem to be bothered by it. Sound quality is great. More comfortable than QC2 to wear (lighter, and on-the-ear as opposed to around the ears). I've been using the QC3 for over a year now and I love them. Great build quality. It's built MUCH better than the terrible Tri-Port headphones which I believe are discontinued. The main benefit of these are the passive (noises from trains and planes) noise canceling and the comfort. These are possibly the most comfortable headphones in the market. They are very light and just rest on your ears and you often forget you have anything on. The leather on the ear covers are so soft it's a pleasure to wear these.